Sometimes I really believe that every man in the world likes ricotta cheese. It would be weird that it was not so. It is so tasty! Nowadays, you can buy this cheese in almost every better-stocked store, but making it by yourself is always ‘something special’, right? My grandma made it, and my mom did it every time I came home for any reason. Now, I make it for my family. I don’t need to tell you that I am not the only one in the family that loves ricotta immensely. My husband and children just don’t have any limitations when it comes to this type of cheese, and I genuinely believe that there is no quantity to make that would be enough for them. Well, to be honest, there are no limitations for all of us when this cheese is on the table. Let’s learn how to make this ‘specialty of the house’ right now! What is Exactly Ricotta Cheese? How Complicated Is It to Make Homemade Ricotta Cheese? It is said that Ricotta is the cheese that isn’t a cheese at all. Well, the word ‘ricotta’ literally means ‘recooked’, which means that it is actually a ‘latticino’ (a dairy by-product). 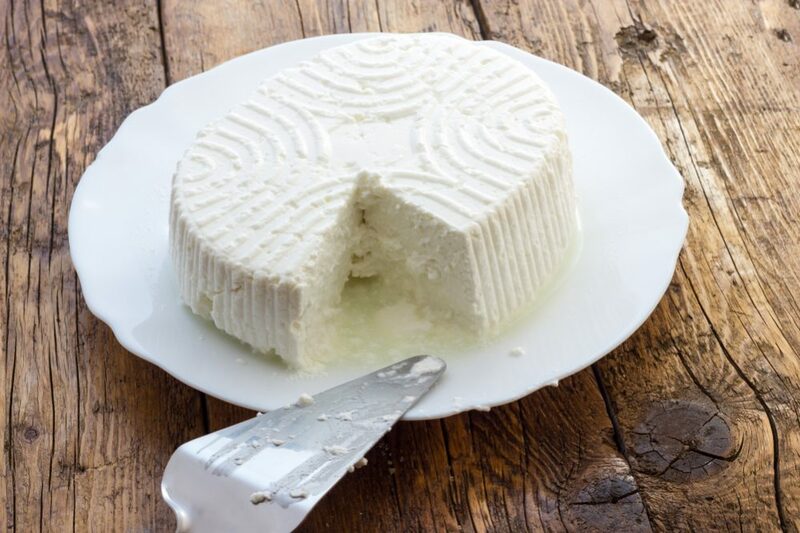 Italians make this cheese from the whey of different types of milk, including this one they get from goats, sheep, cows, even from Italian water buffalos. On the other word, this cheese is a way of reusing waste after making the ‘right cheese’. After the casein coagulate (during a process of making cheese), albumin and globulin remain in the whey. We get ricotta because these two proteins coagulate after adding vinegar or lemon. 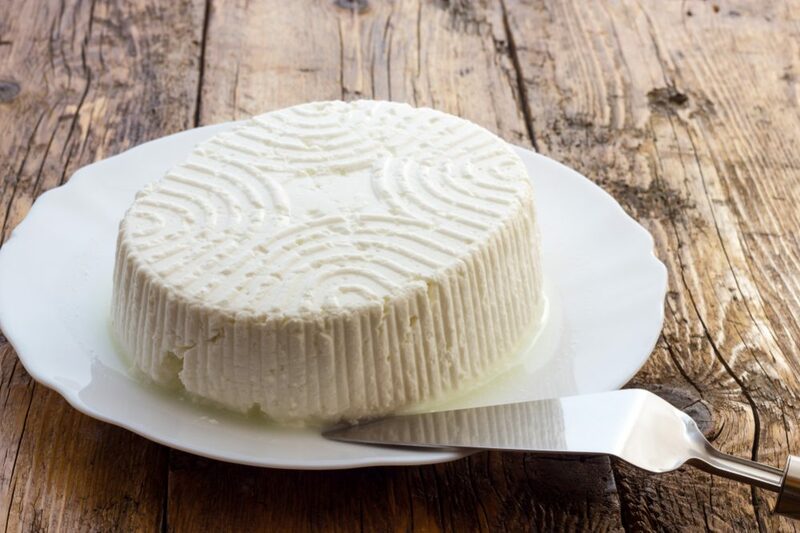 With its slightly sweet flavor and soft texture, this creamy, fresh cheese has been an essential part of Italian cuisine for centuries. 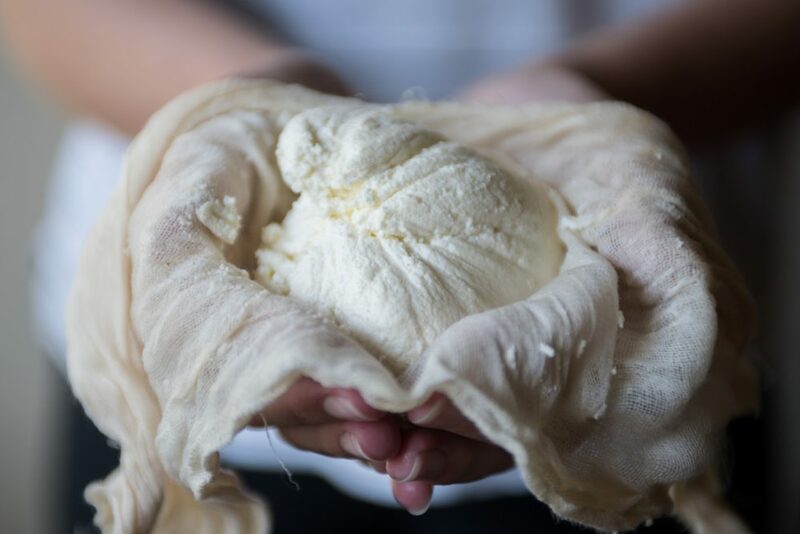 However, nowadays many chefs around the world can’t imagine their masterpieces from the kitchen without ricotta. You can combine this delicious cheese with salads, melon, and Prosciutto. Also, it gives perfect taste to Ravioli, Lasagna, Manicotti, Tortellini, and Cannelloni. As a big fan of sweets, I discovered that it is excellent when mixed with chocolate, fruit (especially tangerines and berries), and honey. Can you believe that you can make some cheesecake with this cheese either? Plus, it can ‘rescue’ you when unexpected guests come. Just put ricotta on the plate, add some sweet rolls or bagels, and serve them with light, crisp white wines (Sauvignon Blanc, for example). In fact, you will be surprised when I tell you that you just need half an hour, some milk, and lemon juice to make perfect creamy homemade ricotta cheese that your family will adore. What am I saying – half an hour of hard working? NO! You just need to add vinegar or lemon juice in boiled milk and wait for a while. After the curds strain, you can use it right away. That’s it! Everything else is a matter of skills, imagination, and the right recipe. Let’s take a look. The first step is essential. You need to choose adequate milk. You really need whole milk (3.25% milk fat). The tolerable minimum is reduced-fat milk (2%). Unfortunately, don’t think that you can get a desirable result with skim and nonfat milk. Plus, avoid pasteurized one, because a process of pasteurization changes the structure of the milk’s proteins. Consequently, they won’t separate appropriately. Secondly, don’t overdo it! Every time make just as much cheese as you need at that moment. For example, if you need two cups of ricotta, you will need only a half gallon of milk (it is less than 2 l). If you need more, you can easily adjust the recipe. Finally, I need to say that I have never had an opportunity to make traditional ricotta. However, these simplified methods are good enough for making a quick batch of this delicious cheese in home conditions. One thing I can tell you for sure. Once you make your own ricotta, you will never want to try the one from the tube again. Its texture is entirely different, and the flavor is simply incomparable. 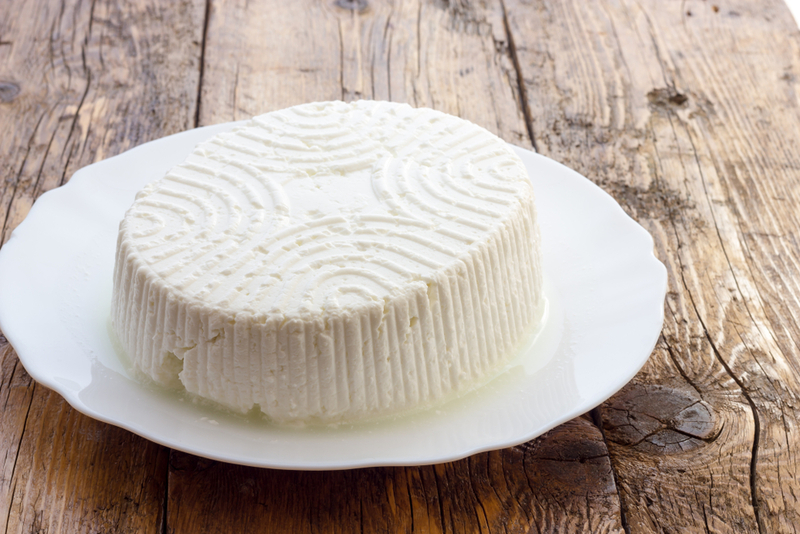 There are two ways to make good homemade ricotta cheese, by using milk or whey. I will give you two variations for making ricotta directly from milk. Before you start making ricotta, you should prepare the fine-mesh strainer with an adequate piece of cheesecloth over it. Put it over the bowl to be ready for the cheese mixture. That is necessary for separating whey from your future cheese curds. Let’s start with heating the mixture of milk, heavy cream, and a pinch of salt over medium-high heat. When the mixture reaches 200 F (95C), turn off the heat. Cool the milk for about five minutes to achieve the desired temperature. It is recommended to use a thermometer because the success of the process of separation curds from whey depends directly on precisely measured milk temperature. Now the challenge begins. You need to pour the vinegar (very slowly) with one hand and to stir milk and cream mixture constantly. During this process, the vinegar will cause coagulation and separation the curds from whey. 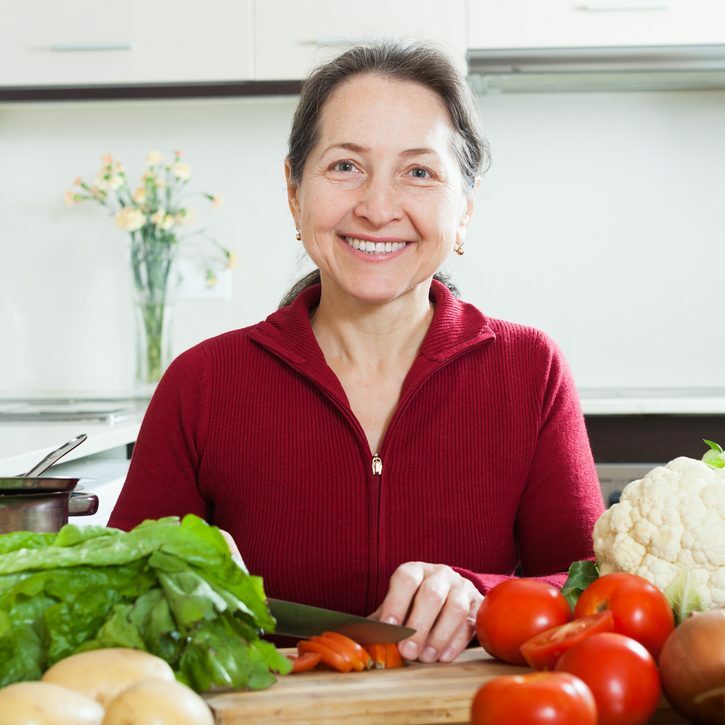 Over time, you can play with flavors, and use lemon juice or rennet instead of vinegar. After approximately fifteen minutes, the mixture will become thick when the curds separate from whey and start floating on the top. Ladle it into the prepared strainer with cheesecloth and let it drain for about half an hour. The time of the draining will vary from what type of ricotta you want to get. For a creamy cheese, you can stop draining after ten minutes. If you prefer getting drier cheese, you need to wait for an hour. The ricotta you get this way is ready to use right away, but generally, you can keep it in the refrigerator for five to seven days. Pour the milk into a pot and warm it to 200 F (95C) over medium heat. When it gets foamy, remove it from heat and add the lemon juice and a pinch of salt in it. After about ten minutes, milk will become separated into the white curds and whey. Put formed pieces of curds into a strainer covered with cheesecloth and strain them. Let it drain up to an hour, depending on the preferred humidity level of your ricotta. If you let it drain too long and the cheese becomes too dry, you can quickly solve the problem by adding some whey over the made ricotta. The flavor of ricotta you get by using lemon juice is slightly different than when you use vinegar. Maybe you should try to make both versions and decide which one is more delicious for you. 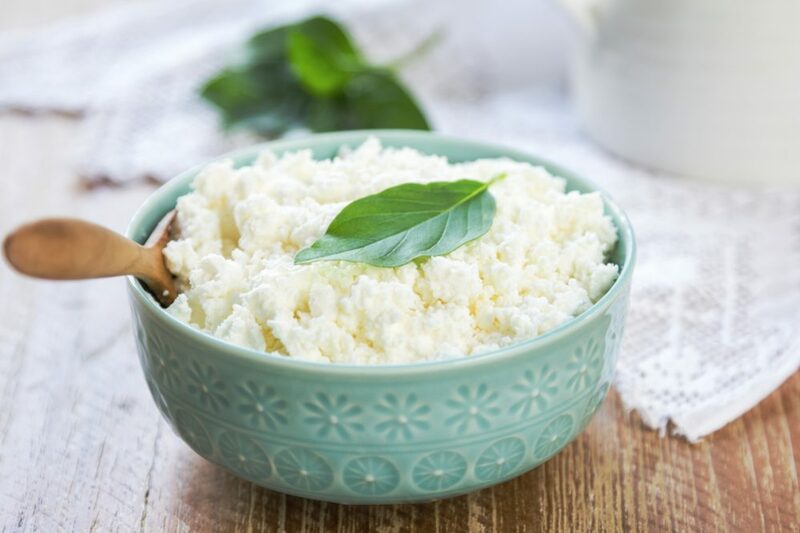 If you saved some whey after you made your favorite cheese, you could use it to make homemade ricotta. Filter whey as much as possible to avoid the appearance of tough ‘beads’ in your ricotta. You should wait for approximately twelve hours before start making ricotta. It is necessary to let whey develops adequate acidity because the acidic environment allows coagulation. Thanks to this process, you don’t need to add lemon juice or vinegar to get separated curds. When the process is finished, start with heating the acidified whey. Its surface will become white when the temperature reaches 175 F (80C). That is a moment when you should begin to stir. Keep doing that until the 200 F (95C). Remove the pot from heat and let whey curdle until it cools down slightly. After a while, you will notice the appearance of the curds. You should drain it, but try not to stir it up. The process usually lasts up to three hours. After that period, you will get the entirely drain whey and great homemade ricotta. Move cheese from the cloth, use it right away or store it in the refrigerator for a few days. If it is necessary, you can freeze it for the next occasion. Yes, buying ricotta cheese in the nearby store is a comfortable and quick way to get this unique and often unavoidable ingredient of every Italian recipe. However, once you make a meal with homemade ricotta, you will never want to serve bought cheese to your family again. The difference between them is definitely visible and entirely astonishing! The secret is in freshness, softness, and taste. Believe me! There is no better way to make your family happy with less effort.